ChiroMom offers chiropractic care, massage therapy, nutritional counseling and lifestyle education, in a modern, relaxing, warm environment. 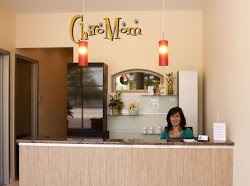 At ChiroMom, we focus on promoting wellness and providing the highest level of innovative care. 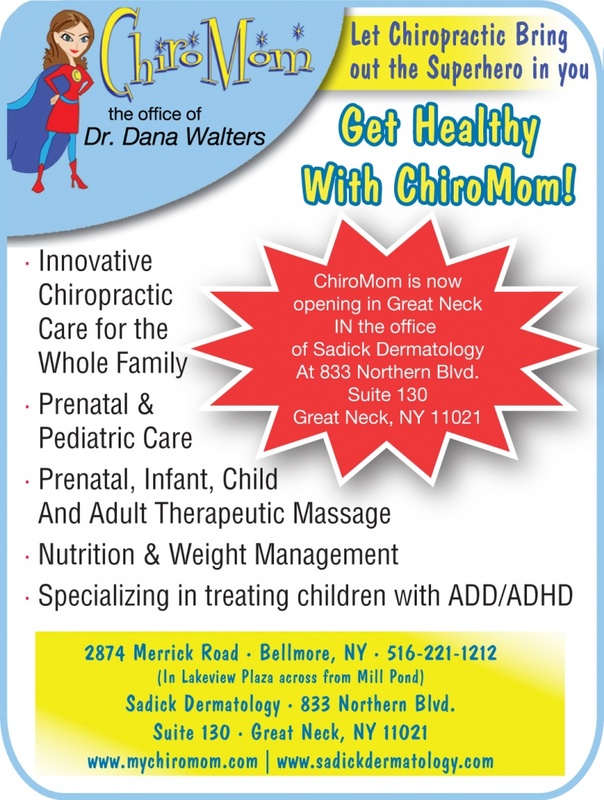 ChiroMom is conveniently located at: 2874 Merrick Road, Bellmore, NY 11710 All treatments, exams, consultations and events take place at ChiroMom’s state-of-the art, spacious Bellmore location designed to soothe and welcome visitors. Our office has several individual treatment rooms and a larger community room where classes and events are held. We also provide nutritional and herbal supplements, and other selected healthcare products for retail sale. Many parents are looking for holistic approaches to support their child’s health and wellness. While conventional medicine is appropriate to monitor a child’s health condition and growth, there are often complementary ways to keep your child in balance as he or she passes through the stages of growth from infancy through adolescence. A child’s body is not like an adult’s body. In Chinese medicine it is understood that a child’s digestive system doesn’t fully develop until the age of six. Additionally, a child is growing and developing rapidly, and being exposed for the first time to many different infections and environmental stressors. At ChiroMom, our team of professional healthcare specialists will work with you and your child to support his or her optimal wellness, including recovery from the common ailments of childhood – allergies, colds, ear infections, colic and more. Arvigo Mayan abdominal massage is a modern adaptation of ancient Mayan healing techniques that adds modern knowledge of anatomy, physiology and herbology. This technique gently manipulates the muscles and tendons that hold all the belly organs in place to bring all things back into alignment and promote proper functioning. Mayan abdominal massage is a non-invasive treatment that can help increase fertility, regulate periods and correct prolapsed uterus. Eileen Assante, licensed massage therapist at ChiroMom explains that in women, the Mayan Abdominal Massage Technique is used to treat infertility, prolapsed uterus and/ or bladder, ovarian cysts, uterine fibroids, endometriosis, irregular or painful menstrual cycles and ovulation, PMS/depression with menstruation and menopausal symptoms. Chiropractic Care in conjunction with Mayan Abdominal Massage is very beneficial in helping with many of the conditions mentioned above. Chiropractic adjustments help to remove irritations to the nervous system which may occur from physical, emotional and chemical stressors that the body experiences. When the nervous system is properly functioning the body can then function at its optimal potential. Detoxification is an exciting tool in natural medicine for its simplicity, low cost and superior therapeutic results. There are many toxins in our environment, including pesticides and industrial chemicals which enter our bodies through the the air, food and water. If we allow these toxins to remain trapped in our bodies we may develop health issues. Some of the benefits of participating in a Detoxification /Cleanse plan include increased energy, weight loss, healthier skin , more restful sleep, clearer thinking, happier mood and more! A gentle cleanse may be accomplished by combining well formulated nutritional products and antioxidants together with whole foods including lean proteins and fresh fruits and vegetables while eliminating foods that cause sensitivities and inflammation. At ChiroMom we are offering small group and individual supervised Detox/Cleanse programs. See and Feel the results almost immediately! Dr. Dana Walters is a chiropractor specializing in prenatal, pediatric care, and care for the entire family. Dana has brought her love of chiropractics and passion for helping families to Bellmore as ChiroMom. Chiropractic care has been shown to reduce symptoms and improve behavior in children with ADD and ADHD. It also is an effective treatment option for children with autism spectrum disorders. Techniques include immune boosting treatments, musculoskeletal and nutritional work, activator techniques, and massage therapy. Dr. Dana Walters is a chiropractor specializing in prenatal and pediatric care. Dr. Walters has practiced in a variety of areas, including Manhattan’s Upper West Side, and has brought her passion for helping families discover the benefits of chiropractic care to Bellmore, as ChiroMom. ChiroMom offers chiropractic care utilizing techniques including immune boosting treatments, musculoskeletal and nutritional work, activator techniques, massage therapy, and lifestyle education. As a mom, Dr. Walters experiences first-hand how chiropractic care throughout pregnancy, birth, and childhood sets a solid foundation for greater health and well-being.